The LHASA APSO has been in Tibetan monasteries for 2000 years. In its country of origin the breed was esteemed as companion and watch dogs, as it still is in all parts of the world. It is said that the Tibetan Mastiff stood guard outside the homes and monasteries while the little LHASA APSO gave warning of any intruder that might have slipped indoors. protector of Buddha. Legend has it that lamas who failed to reach Nirvana were reincarnated as LHASA APSOS. LHASA APSOS were regarded as good luck talismans that kept evil away and were never sold but given as gifts to those the lamas held in high esteem. In 1921, a member of the Indian Medical Service was given two LHASA APSOS by a grateful patient. These dogs were later given to the wife of a British officer serving in Tibet, who brought them with her when she returned to Britain. As recently as 1948, Tenzing Norkay, the Sherpa guide who was to accompany Sir Edmund Hillary on his ascent of Mount Everest in l953, was presented with two LHASA APSOS from the Ghangar Monastery in Tibet. 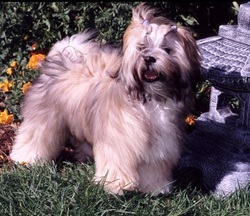 Tenzing became a breeder of Lhasa Apsos. By 1933, LHASA APSOS were established in England as the Lhasa Terrier but with the formation of the Tibetan Breeds Association in l934 the name was changed to LHASA APSO and the breed shown in the Utility Group. First Canadian registrations were recorded in l934 under the breed name Lhassa(sic) Terrier and classified in the Terrier Group. The name was later changed to LHASA APSO. In January 1974, the LHASA APSO was reclassified and is now a member of the Non-Sporting Group. LHASA APSOS were registered in the United States in l935 where they are also shown in the Non-Sporting Group.